Daughter: Amma, What are you preparing today? Amma: Fried rice. Is it ok? Daughter: Wow, fried rice, amma it is my favorite. I love you amma. Four year old baby excited. Ten to 15 minutes later, mother served her favorite dish. Daughter: Amma, you made uppuma, you promised me that you will make fried rice today. Amma: No baby, look it is fried rice. Daughter: No, amma, I don't feel it is fried rice and bad taste too. I won’t eat this. This was the condition of my first fried rice. My daughter was right. It was a just like uppuma, a mixture of overcooked broken rice with lots vegetables and sauces. Initially, I never got a perfectly cooked, soft separated grains. It was always under-cooked or overcooked. Gradually I understood that to get a perfect texture, the cooking point of rice is very important. Let us peep into those points before proceeding to the next. Usually for fried rice and the pulaos (especially when we cook rice first, then sauteed with veggies), I prefer to cook them in an open pot with lots of water which is later strained and discarded. I feel, this method gives us a perfect texture of rice while making pulao and other rice recipes. 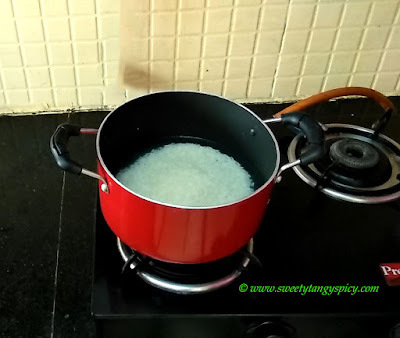 In this post, I tried to explain the open pot method to cook rice. The selection of rice is also very important. 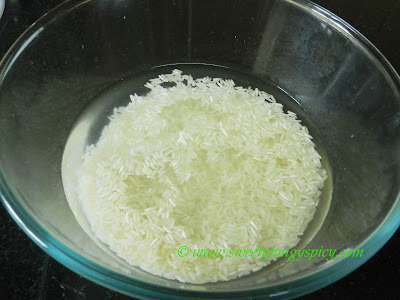 Always, try to select good quality basmati rice. For fried rice and pulao like lemon rice, vegetable pulao etc, I usually use India gate basmati rice. I never buy loose rice because of the hygienic issues. Also, I want to store this for a long time as fried rice and pulao are prepared occasionally in my home. Always soak rice for at least 20 to 30 minutes after washing in cold water till the water runs clear. 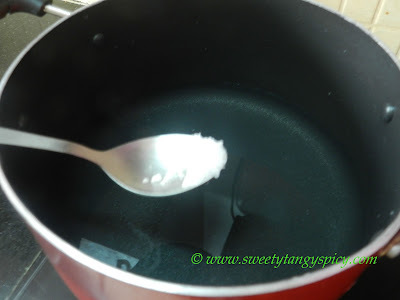 This will decrease the cooking time considerably and will also yield soft grains. Usually, the soaking time will be shown in the back side of the pack. Never use rice without soaking. Even if we use normal rice (I am using Kerala red rice or matta ) for cooking, it is recommended to soak for at least half an hour. We can cook rice in three different ways, two pot methods and pressure cooker method. 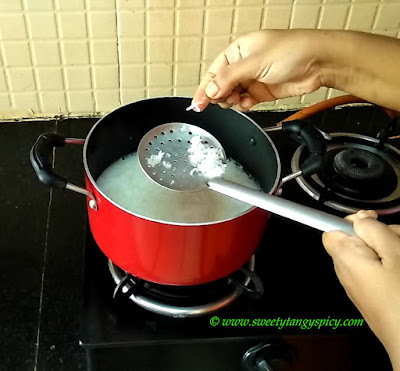 I always prefer the open pot method for fried rice, lemon rice, biriyani etc because we can stop the preparation at any time we need. 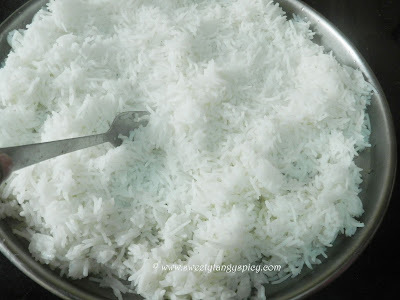 The rice should not be cooked completely because the rice will be cook a little more even if stop cooking. This is due to the temperature with rice. 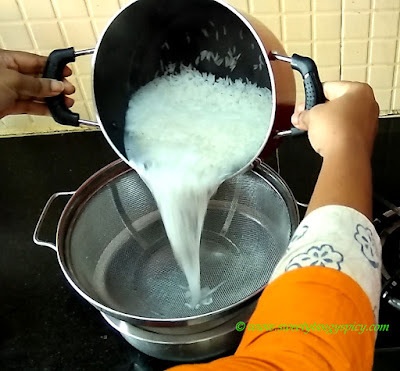 So if your rice cooked completely or over cooked, then you can pour some cold water to stop further cooking. So always leave a bit on rice or cook only 80%. Let us take 5 to 6 cups of water in a vessel. Add enough salt. Addition of salt in this step is optional. I usually add as it will remove the burden of mixing while sauteing with the veggies. This will also prevent the breaking of rice. Switch on the flame. Let it boil completely before adding rice. 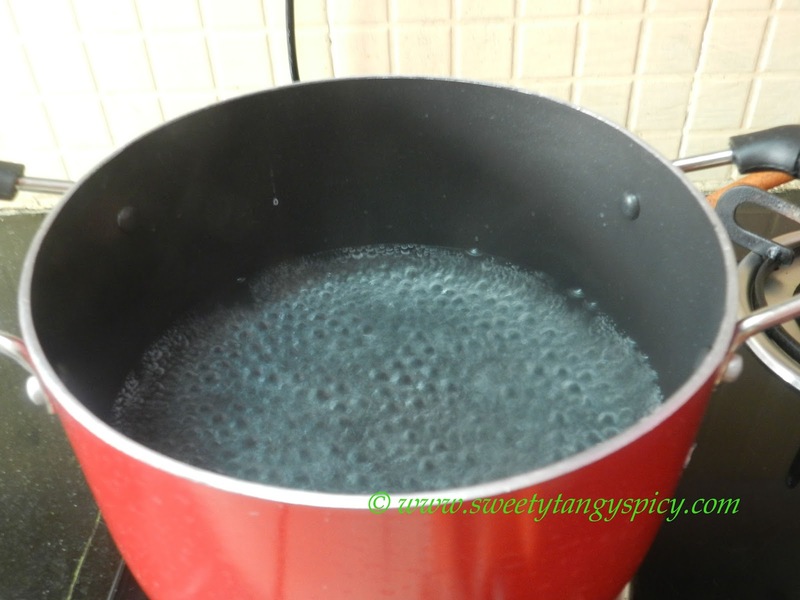 Once the water starts to boil, reduce the flame to medium. Then add the soaked rice. Let it cook on low-medium flame till became 80% cook. 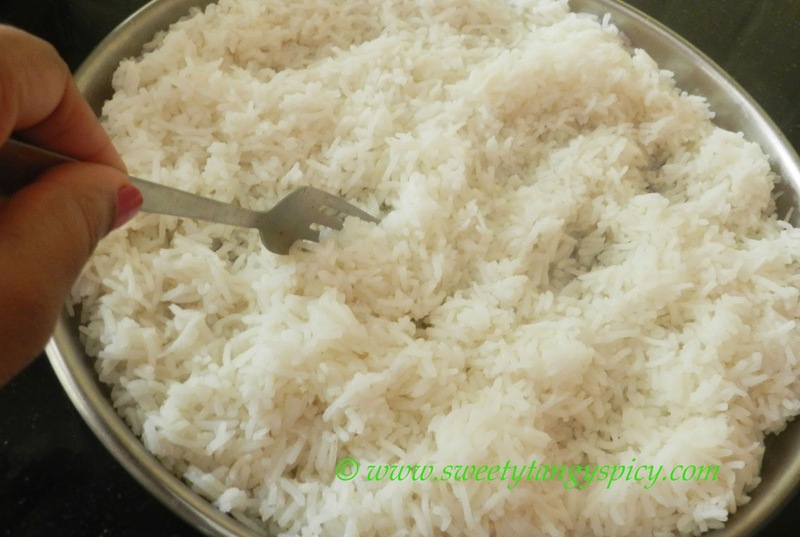 The rice should not be too hard or too soft at this stage. When you press between your fingers, the rice will mash up, but you have to apply little pressure to do so. 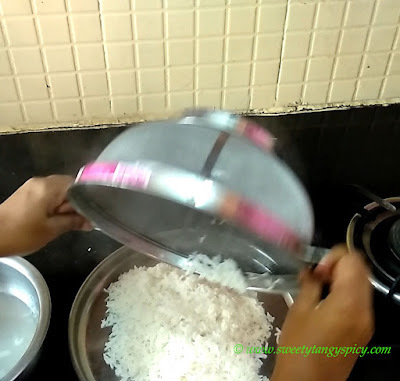 Immediately strain the rice, I prefer to use a strainer, because, if we strain the rice within the pot itself, then there is a chance to overcook the rice due to the heat inside the pot. So always use a strainer. Once the water has been strained, then immediately transfer and spread onto a plate or muslin cloth. Separate the grains with a fork. But softly, the grains should not break. Then cool this completely before use. Also, before use, just separate the grains with a fork or spoon. Use as required. 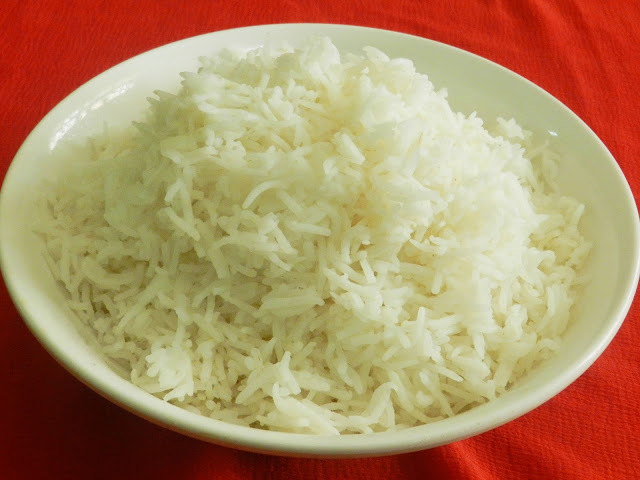 If you feel the rice is overcooked, then no problem, just pour some cold water to stop further cooking. 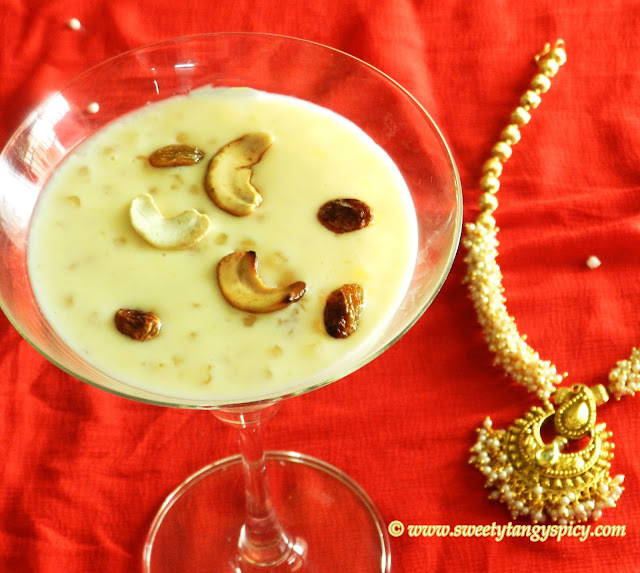 Strain immediately and spread on the a plate or muslin cloth. The rice should be cooled completely before use. Otherwise rice will break and will spoil the entire dish.